When Broheimer tells his siblings there is going to be a blood moon, they are excited. Gothina decides to make a picnic out of it, but finds they don’t have enough tomatoes. With Baby Zom and Kamper tagging along, the kids take the Moorevette out for a ride. What follows is a fun adventure including a quest for tomatoes, an encounter with a scarecrow, and an empty campsite which might belong to zombie hunters. Thanks to Broheimer, the kids come to understand how and why the blood moon occurs. Grab a tomato slushy and find out if the Moores will be able to view this amazing sight without being discovered by humans! My son and I stayed up late to watch the blood moon last year (2014). It was an amazing sight which neither of us had seen before, and of course I didn’t video it. I thought any term with the word “blood” in it would be a great zombie topic. This is my first chapter book and I was happy to be able to expound on the characters, including back stories. 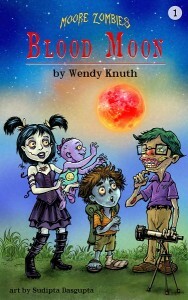 So, I wrapped a whole story around the blood moon experience including real information along with fun twists on the zombie theme to keep things in line with my kinder, gentler zombie characters. As this is a recurring series, I will tell you about my character, Gothina. She was slightly based on one of my nieces who was into goth when she was in high school. Looking for an atypical zombie, I thought this would make for a great zombie character. Of course it entails make-up with a pale face, heavy duty boots, and a certain style of dress. Honestly it took me awhile to come up with a name. Unable to come up with a name that would scream “goth” I returned to the name of the style itself, which in retrospect seems like an “um, duh” moment. After playing around with the word goth, and what would be considered girl type endings for names, I came up with Gothina. Kamper always carries his backpack with him. It is full of all sorts of interesting objects. “Of course I do,” answers Kamper. He finds a pen and gives it to Broheimer. Broheimer takes it apart and says, “Here, you can use this as a pill bug shooter.” He hands the empty tube to Kamper. “Wow, how cool!” shouts Kamper. He pockets a handful of pill bugs. He puts one in the tube and blows on the other end. The pill bug soars across the yard and hits Broheimer’s telescope. Kamper is perplexed. “Isn’t there an amazing sight in the sky every night?” he asks. “Yes, but this one doesn’t happen very often,” Broheimer answers.